Port Waratah Coal Services Limited (PWCS), located in the port of Newcastle, NSW, Australia, operates one of the world's largest and most efficient coal handling operations. Its Kooragang terminal, located on 160 hectares of land on Kooragang Island in NSW, began operating in 1984. The terminal is undergoing the third stage of an expansion programme to increase the total ship loading capacity of PWCS to 89 million tonnes per year. Stage 3 of the expansion is due for completion by September 2001. PWCS contracted David Brown Gear Industries Limited (DBGI) to supply all the conveyor drive assemblies for Stage 3. DBGI, located in Bulli, NSW, have been engineering drive solutions for a diverse range of applications, for over 140 years. Their market coverage currently extends across Australasia, Europe, North America the South Pacific and South Africa. Their extensive manufacturing facilities are capable of producing gearboxes from as little as 5 kg to more than 250 tonnes. As part of this contract, DBGI is to design and install sixteen special purpose B2-560SP gearboxes together with the convey drives. The 800 kW (at 988 RPM), two-stage reduction gearboxes consist of a combination of bevel and helical gears. As part of the design effort to reduce the overall noise level, particular attention has also been given to the design of the gearbox itself. The upper and lower gearbox casings will be cast from SG Iron. These cases will offer excellent vibration and sound damping capability. An additional customer requirement is that the gearbox casing be designed without any flat surfaces to reduce the accumulation of coal dust settling on the gearbox. This has resulted in a rather novel shape for the upper casing. 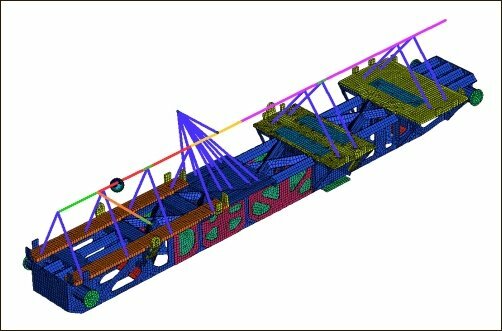 As part of the design phase of the project, Strand7 Consulting carried out natural frequency analysis of the gearbox to investigate the vibration characteristics of the gearbox shell and assembly. This was carried out in conjunction with physical testing by the client. DBGI are using AutoCAD® Mechanical Desktop (MD) to generate the solid models of the proposed gearbox. The solid models are fully featured consisting of numerous small fillets, chamfers and blends. Detailed features such as these usually complicate the process of automatic meshing. A common approach for facilitating the analysis phase is to de-feature the CAD models in preparation for FEA. However, this requires additional work at the CAD level, as often two CAD models need to be maintained, one for design and another for analysis. All this adds time to the design process and potentially introduces errors when tasks are duplicated. Strand7's geometry cleaning tools were used to detect and correct numerous anomalies on import of the geometry file. Small or undesirable features were also removed using the cleaning tools. This was very appealing to the engineers at DBGI since they could take their detailed DWG file, export it as an ACIS® SAT file and then import directly into Strand7 and mesh it. Alternative designs could be compared quickly because a single CAD model could be used for the entire design cycle. In the analysis of the gearbox, the internal shafts, gears and bearings were also included. These provide additional mass and stiffness that need to be considered in the frequency analysis. Shafts and lumped masses (translational and rotational) were inserted in the model using Strand7's interactive element generation tools, as these components were not part of the solid model. This was an efficient operation because shafts and bearings could be modelled using simple beam elements thereby helping to keep the model size down. The whole mesh consists of around 400,000 tetrahedral elements. The natural frequency solver was run for each design to extract all frequencies and modes up to the second harmonic of the first gear meshing frequency. Typical shapes for some of the relevant modes are shown below. As the main purpose of the FEA was to do comparative studies of various proposed designs, the relatively short turnaround time allowed a number of shapes and rib sizes to be assessed. The information extracted from the FEA results was compared to the results of "bump tests" conducted on the initial castings of the gearbox. The results, in combination with physical testing, were used to help minimise vibration and noise to bring the gearbox within the strict environmental guidelines. Strand7 Consulting also completed an analysis of the baseplate used for this gearbox. This involved using the Automesher to produce a plate mesh of the baseframe weldment based on a CAD solid model. Once the plate mesh was complete, with thicknesses assigned, beam elements were added to incorporate the added stiffness and mass of the gearbox, motor and other equipment attached to the baseplate. The data for these components were supplied by David Brown Gear Industries with the mass and inertia properties of the gearbox taken from the Strand7 model used for the natural frequency analysis. 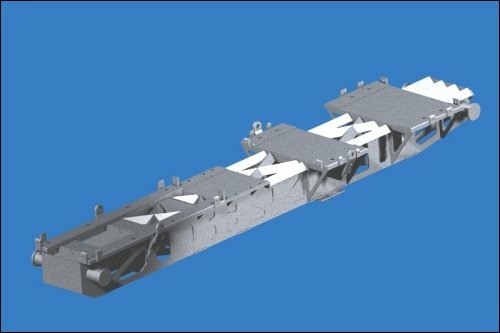 The torque loading was applied to the model and solutions were obtained for natural frequencies and stresses in the steel plates.